The art and science of aromatherapy has it's roots in the most ancient healing practices and spiritual traditions, dating back thousands of years when early peoples first discovered the medicinal properties of plants. The holy anointing oil that God directed Moses to make from "'flowing' myrrh, sweet cinnamon, calamus, cassia and olive oil" is a powerful anti-viral and antibiotic blend (amongst other properties) which would have provided protection and treatment to all those to whom it was administered. In aromatherapy treatments, essential oils are applied externally, but their penetrative power is so great that they act on the internal organs and at the emotional and spiritual levels. In fact external application is the most effective way of administering the oils. Essential oils enter and leave the body quite readily - leaving behind no toxins. Essential oils, like the blood running through our veins, are the essence or the spirit of the plant; when properly preserved, they have their own energy-force and vibrational quality which can be so healing when correctly used. The subtle healing properties of essential oils operate on a higher plane than chemical drugs, having a much more powerful effect on the psyche and the emotions. The aroma of the oil is related of course to it's chemical composition, or molecular makeup. At the molecular level, the vibratory rate of the oils can compliment that of the human energy field or aura, enhancing and extending it, in effect energising it. It is not for nothing that perfumeries the world over speak of the low, middle and high notes - referring indirectly to the evaporatory rate of the oils and of course their particular vibration or 'octave'. Essential oils offer a gentle and sensitive alternative to the dangers of synthetic drugs, which have caused an increasing number of adverse side-effects, allergic reactions, drug-dependence and addictions among patients. However, it should be noted that certain oils too have their specific application and contra-indications. The ones that we need to take especial care with are outlined in the table of "Hazardous Essential Oils" below. If not trained in aromatherapy it is wise to only use them in such a manner that they do not directly come into contact with the skin. The safest of all methods is the use of diffusers or 'oil burners'. The most important property of essential oils is the balancing effect they have on the body, since an imbalanced state in the body (the Physical, Emotional and the Etheric bodies) is the surest way of developing disharmony and dis-ease in your life. Essential oils also have a very wide range of medicinal and therapeutic properties, and there are many ailments which can be treated by these most natural of all plant medicines. 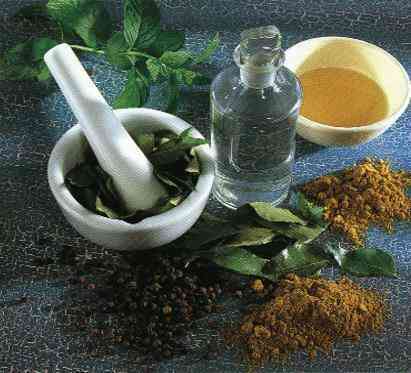 Aromatherapy can be used to complement Western medicine and other forms of alternative therapy, as it often combines to great advantage with other forms of treatment. Essential oils can enter the body and be 'absorbed' through the skin (and the olfactory receptors) at the molecular level. Warm skin absorbs more oil, so covering an area up after massaging it will aid in take up of the oil. The oils also waft into the nostrils from air - the aroma. When these molecules hit nerve olfactory receptors, they set off a reaction which results in altered brain activity which is measurable by electroencephlagrahic (EEG) techniques. What are Essential Oils made from? Dependant on the plant species, oils are extracted from the petals, leaves, roots, buds, twigs, rhizomes, wood, bark, resin or fruit of the plant. There are several ways of obtaining the oil. The most common being steam distillation. To aid at times of illness and dis-ease. Treatment's have also gained in popularity as a natural method of stress relief. Aromatherapy need not be applied through massage - when used in the bath, or used in an oil burner, oils are just as effective at making people feel more relaxed and confident. Use of oils can also help "energise life". Essential oils add to the quality of life, as no other substance appears to do. Experimentation shows that the aromas can influence our moods and the way we think. Memories, even deeply buried ones, can be evoked by certain aromas which will be unique to each individual. Certain smells can elevate or lighten our mood; others can assist in meditation and contemplation; still others will act on higher (and lower) levels of consciousness. 1: Do not take essential oils internally. 2: Keep away from eyes and out of reach of children. If you get undiluted oil into the eyes area rinse out immediately with lots of water. 3: Don't apply undiluted, pure essential oils to skin unless advised to do so. 4: Women who are, or may be, pregnant or are breastfeeding should avoid Cinnamon, basil, juniper, fennel, rosemary, thyme, clary sage, oregano, clove, nutmeg, bay, pimento berry, sage, hyssop, wintergreen and brich oils. 5: Avoid using any citrus oils, especially Bergamot, if you are to go out into the sun within four hours. These have a photosensitizing effect on the skin, increasing the sensitivity and making it more likely to burn. MOST IMPORTANT! !...Allergy Check! If you have an allergy to nuts, choose a seed based oil. If you have an allergy to wheat avoid using wheatgerm oil. If you have an allergy to a vegetable which produces an oil e.g. avocado, avoid using the relevant oil. Using Oils: How should I use them? Oils are potent natural essences. Because they are so concentrated they must be diluted before they are safe to use on the skin. Although called essential oils they do not feel oily. They need to be blended in a carrier oil before they can be used in Massage. Once diluted in a carrier oil they are safe to be used and are absorbed easily. Do be guided by your nose. Certain oils have particular benefits, but often the right one for you is the one you like the best. Do experiment with blends. A mix of two of three oils can smell and feel fantastic. Don't use essential oils during pregnancy without expert guidance. Don't allow children to play with essential oils. The list shown below contains essential oils that should not be used in aromatherapy without the express administration by a qualified and experienced aromatherapy practitioner. Do not assume that an oil is safe to use if it is not on this list. Important Note: The information provided is for educational purposes only, and is not intended as a substitute for medical advice. General Safety Information: Do not take any oils internally without consultation from a qualified aromatherapy practitioner. Do not apply undiluted essential oils, absolutes, CO2s or other concentrated essences directly onto the skin. If you are pregnant, epileptic, have liver damage, have cancer, or have any other medical problem, use oils only under the proper guidance of a qualified aromatherapy practitioner. Use extreme caution when using oils with children and give children only the gentlest oils at extremely low doses. It is safest to consult a qualified aromatherapy practitioner before using oils with children. For in-depth information on oil safety issues, read "Essential Oil Safety" by Robert Tisserand. Using a 15ml amber bottle or similar, pour 10ml of carrier oil into a measuring cup. Pour in into the bottle using a funnel to avoid spillage. Add two drops of your essential oil, and shake to mix. Each oil falls into one of three categories - Top, Middle, and Bottom or Base note. Oils with TOP notes are the most volatile, and so have a more immediate effect on the sense of smell. Citrus oils fall into this group. Oils with MIDDLE notes are more muted and evaporate less easily i.e. Herbaceous oils like lavender and juniper. BOTTOM or Base notes have a long lasting smell and includes Sandalwood and Ylang Ylang. When blending you need to take into account the notes of oils. Mixing oils with the same note will not generally produce a balanced and effective blend. Carrier oils are used to dilute the essential oils for skin and other applications. Grapeseed and Sweet almond oil are the best general purpose carrier oils, and for beginners you will probably use one or other. However there are more...here comes the list with pro's and con's. Description: Odourless, colourless to pale yellow. Useful for: All skin types, especially elderly, inflamed and dry skin. Good for facial care because it is light and well absorbed. Description: Available in both refined and unrefined forms. Refined is odourless, pale to slightly greenish in colour, whereas the unrefined is dark green and is best used combined with another carrier oil. Unrefined has a shorter shelf life (~4 months). Useful for: Dry and Dehydrated skin. Description: Has a light smell, pale green in colour. Grapeseed oil is very versitila and easily absorbed. Useful for: Most skin types. Avoid using on sensitive skin, eczema and psoriasis. Description: Has a slight smell, pale to golden yellow in colour. A waxy oil with long shelf life. Useful for: All skin types including inflammed, red, dry or older skins, eczema, psoriasis and acne. Cost: Expensive - reflects versitality. Description: Has a slight smell, pale to dark yellow in colour. Has usually been heat treated. Useful for: Not generally used by aromatherapists. However it is easy to find and can be used for body massage when you first begin. Not for use on face or healthcare recipes. Description: Odourless and pale colour. Useful for: Nourishing, softening and revitilising all skin types. Helps relieve itching, soreness, dryness, inflammation, and wrinkled and dry hands. Best to use on children and babies. Description: Strong odour unless refined and can adversely affect the smell of any recipe. A very heavy oil, always used as an addition to another carrier oil, never on it's own. Useful for: Primarily aged skin, eczema and psoriasis. Not to be used on children. Although oils can be used singly, aromatherapists tend to blend two or three or more oils together to match the person's physical and emotional needs. Rule number one is - go with what you like. The best way to make a blend is to circle two or three bottles of oil under your nose to get the idea of how they will work together before you start to mix and blend them. Select an oil which best matches your symptoms, for example, if you are suffering with nervous tension, lavender would be ideal. If you are not keen on lavender, use an appropriate substitution. To mix, simply put together a well balanced blend that contains a top middle and base note. Other compatible blends includes are spices with citrus, florals with citrus, peppery notes with woods, and resins with floral and citrus (e.g. frankicense, rose and mandarin). Fragrance throughout the ages has been said to alert the gods to our presence and act as a sign that the human mind is focussed and receptive to spiritual guidance. Fragrance and spirituality mingle as one in the spiritual traditions of the world. As fragrance can open the doorway to memories and emotions, they can be quite useful in ameliorating or even releasing blocks in the flow. These blocks can manifest in several ways in our life, making it hard for us to come to terms with certain of life's aspects and aspects of our own self. Frankincense, Cypress, Rose Maroc, Cedarwood, Roman Chamomile, Sandalwood, Basil, Coriander, Ginger, Bergamot, Cinnamon. Linden Blossom, Jasmine, Pine, Rose Otto, Juniper, Clary Sage, Benzoin, Clove. Frankincense, Neroli, Geranium, Rose Maroc, Ylang Ylang, Clove, Cedarwood, Cardamom, Mandarin. Rose Otto, Neroli, Roman Chamomile, Lavender, Mandarin, Orange. Pine, Tuberose, Carnation, Lemon,. Coriander, Frankincense, Cypress, Cardamom, Myrtle, Juniper. We have already referred to an oils note - it's vibration. The essential oils themselves do not directly harmonise the human aura or energy fields. The aromatic molecule's energy interacts with the energetic and subtle anatomy of the individual. The oil's fragrance molecules stirring, agitating and electrically boosting and stimulating the human energy field. Diffused oils weave their way through the energetic fields, affecting the physical through olfactory nerves/receptors. Any treatment using energetics aims to align all the bodily currents - physically, emotionally, mentally and spiritually. The physical affects the emotional and the psycho-spiritual connections, and the reverse is also true. The energy field of the person extends outside the confines of the physical form. That field and the body it encloses can be changed by the introduction of other energy forces. These external forces/energies can be 'good' or 'bad' for us. Capacity to visualise and understand mental concepts. The ability to carry out ideas in a pratical way. Taking in an assimilating. Sense of self within society and profession. Pleasure and expansiveness, spiritual wisdom, and consciousness of the connectedness of all things. Healing and intentiality toward one's health. ** The spleen in most systems is considered a minor chakra, but as it is the seat of many emotions, and at times of emotional crises works overtime at the physical level, I tend to include it as a 'secondary' of the solar plexus chakra. Both essential oils and crystals can be used by a practitioner to enhance their own energy field, thus facilitating greater flow of Universal energy - this works wonderfully well with all forms of energetic practice, I find them especially useful with Reiki. An essential oil's vibratory frequency can be dramatically influenced by the energy of the person handling them - so it is important to keep your mind pure and ego free when working with oils in energetics. Your focus should be one of Universal Love and Light, working toward the highest good of the individual. If at any time you feel the oil may have picked up a negativity, you can cleanse them in much the same way as you would a crystal, returning them to their natural pure, ego-less energy state. You can do this by covering them with rock salt for twenty four hours -- make sure that the bottle lid is on tight though! Disclaimer — This information is not intended as a replacement for medical advice. Any person with a condition requiring medical attention should consult a qualified practitioner or therapist. - so be sure to bookmark this page!!!!!!! Essences, essential oils, fragrance, extracts books and more!